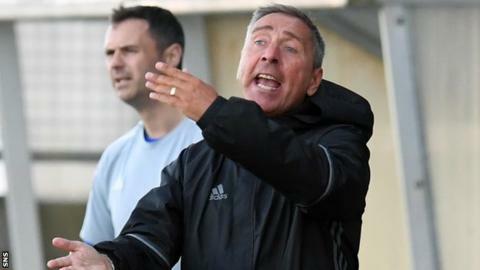 Peterhead retained their five-point lead at the top of Scottish League Two after a 0-0 draw away to second-placed Edinburgh City. Clyde moved to within a point of Edinburgh after Martin McNiff's stoppage-time header in a 2-1 victory over fourth-top Annan Athletic. Albion Rovers moved to within a point of Berwick Rangers at the bottom after a 2-0 win away to Elgin City. Berwick lost 1-0 to Stirling Albion as Cowdenbeath and Queen's Park drew 0-0. Kick-off was delayed to allow a healthy crowd of 1,057 to enter Ainslie Park for the division's game of the day. Despite numerous chances for both sides, with a total of 27 shots registered and nine of those on target, neither team could make a breakthrough, mirroring the result at Peterhead in early February. Peterhead, whose run of six wins ended in with a midweek defeat in Berwick, came closest to breaking the deadlock when striker Ross McAllister's 33rd-minute header struck the crossbar. It meant Edinburgh, who had also lost away to Annan last weekend, failed to narrow the gap despite stretching their unbeaten home run to five games. Clyde would now be top of the table had they not been docked four points earlier this month for fielding an ineligible player and lost away to Elgin City that same day. However, they moved to within six points of Peterhead following late drama at Broadwood in which they were reduced to 10 men as they conceded an equaliser from the penalty spot before securing the win in added time. Mark Lamont fired the Cumbernauld side ahead midway through the second half, but goalkeeper Blair Currie was sent off for violent conduct against Tommy Muir and Tony Wallace fired home the spot-kick for his 12th goal of the season. However, McNiff headed home his second goal in three games to give Clyde a fourth win in five matches to edge them back into the hunt for automatic promotion. Declan Byrne scored both goals for Albion Rovers as they condemned his former side, Elgin, to a third consecutive defeat and secure only their fourth win of the season. The 22-year-old striker, who had previously scored only two goals in his career, netted his brace in the space of 17 first-half minutes to give the Coatbridge side back-to-back wins for the first time since September 2017 and stretch their unbeaten run to three games. Stirling moved above Elgin into fifth place as Berwick suffered a 10th loss in 13 games since the turn of the year. Substitute Dylan Mackin scored the only goal of the game in the 80th minute - his 11th of the season - from the penalty spot after Jack Ogilvie brought down Ronan Hughes. The goalless draw at Central Park stretched Cowdenbeath's run without a win to six games and gave Queen's Park a third game without defeat.